PLAINVILLE - Another week, another record for Plainville senior quarterback Frank Griffin. With a 9-yard completion in the first half of a 31-12 victory at home over Tolland on Friday night, Griffin moved past R.J. Anderson for most passing yards in Plainville High School history, breaking Anderson’s old record of 3,544. Griffin also had another fine rushing game, running for two of the Blue Devils’ four touchdowns in the game, the last of which gave the Blue Devils a 28-0 lead in the first half. He also threw for another touchdown on a 37-yard pass. 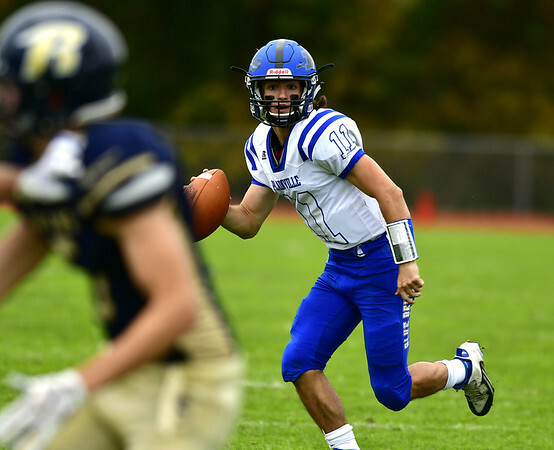 Brendan Quilter got Plainville’s third TD of the game on a 58-yard run and Mason Sarra added a fourth quarter field goal to cap the scoring. Now 5-3 for the season, Plainville hosts Avon (1-6) at 6:30 p.m. next Friday with a chance to clinch its first winning season in four years. Posted in New Britain Herald, Plainville on Friday, 2 November 2018 23:02. Updated: Friday, 2 November 2018 23:05.